Operating research vessels is an important aspect of many hydrographic and oceanographic organisations. The European Research Vessel Operators (ERVO) Group coordinates small to medium-sized research vessels in Europe. This platform provides an opportunity to exchange experiences on issues or problems related to research vessel operators and new developments (and new-build vessels) and to share best practices. 'Hydro International' has interviewed Dr Klas Lackschewitz of GEOMAR, Germany, and chairman of the ERVO Group for 2017-2019 about the organisation and its efforts. ERVO Group is optimising the use of capacity of small and middle-sized research vessels. What do you consider as minimum and maximum sizes? The European Marine Research Fleet has approximately 35 small and middle-sized research vessels that are considered to be ocean class (55-65m) to regional class vessels (30-55m). Could you say something about the available survey capacity of European research vessels? The European research fleets meet high standards in capabilities and equipment, e.g. multibeam echo sounding. However, maintenance and improvement of these standards require continual adaption. There seems to be no overcapacity but renewal remains necessary for the future. Installing new instruments on a vessel often requires technical adaptations of the vessel including steel works and cabling. This means that the installation of such equipment is not always an easy task and can lead to down times when using the vessel for expeditions. How big is the discrepancy in capacity that the ERVO members are looking at? There are a very large number of instruments for marine research with different capabilities and of different use in Europe. However, only a limited number of countries own most of the large and mobile devices. The potential for an enhanced use of such equipment, e.g. deepwater ROVs, 3Dd seismic equipment, large piston corers, portable winches, specialised lab containers, is considerable. However, in order to achieve an enhanced use of this pool, there are many practical issues that need to be considered, e.g. interoperability and technical support. Can you give an example of research cruises that ERVO has facilitated and how the organisation has contributed? ERVO is not directly involved in facilitating cruises such as the Ocean Facilities Exchange Group (OFEG) or the Eurofleets project. But ERVO is a networking group and contacts made and plans developed can lead to some sort of cruise activities. In your profession, you manage the GEOMAR research vessels. Do you experience benefits of ERVO? The ERVO group is very important for me because the members provide an opportunity as research vessel managers to exchange information on our national fleets, highlighting trends in the requirements for sea-going vessels and new technological developments for research vessel operations. Members of the ERVO Group meet once a year during a seminar. What kind of subjects are discussed? ERVO meetings address common technical, operational, safety, environmental and legal issues/problems that affect research vessel operators so as to identify solutions for improving services to the scientific community and developing best practice in the operation of research vessels. For example, we share experiences on all aspects of the International Polar Code with ERVO members. The Code will require ships intending to operate in the defined waters of the Antarctic and Arctic to apply for a Polar Ship Certificate. The Polar Code covers the full range of design, construction, equipment, operations, training, search and rescue and environmental protection matters relevant to ships operating in the waters surrounding the two poles. Other topics addressed during the meetings are: new research vessels being built, international safety management, vessel and equipment insurance, and crew training and health and safety issues. What is the main improvement that should be achieved in managing research vessels? Another way of using the existing fleet more efficiently is to increase the number of their potential users. Joint cruises are an excellent integrating instrument. They could cover the integration of two or more national cruise proposals to work on the same geographical site on a single large platform, each partner covering part of the cost. Joint cruises could give access to large, well-equipped vessels to scientists from countries where such infrastructures are not available. Do different countries have different challenges when it comes to managing research vessels? European countries that own research vessels available to the scientific community have different ways of funding the running costs of research vessels. In the case of large countries with a large research fleet , running costs of the research fleet are fully or partly covered by their government. There are, however, other countries with smaller research fleets or with only one research vessel, whose running costs are not fully guaranteed by public national funds. These vessels are often under funded or the funds have to come from other sources, e.g. commercial charter work. Unmanned survey capacity is increasing. Does this get the attention of the ERVO members? What could be the significance of unmanned survey vehicles for the members and the organisation? The trend is clearly towards more capable, autonomous vehicles able to collect huge amounts of data or map the seabed in real- time and high-resolution. This equipment will become heavier and must be deployed precisely at a specific location. All these factors will also require new technical adaptions on the European research vessels. How does GEOMAR look at unmanned survey capacity? GEOMAR is home to the autonomous underwater vehicle AUV ABYSS, which is a modular AUV designed to survey the ocean combining geophysical studies of the seafloor with oceanographic investigations of the overlying water column. The basic mission of ABYSS is deep-sea exploration. With a maximum mission depth of 6,000 metres, the AUV uses several technologies to map the seafloor accurately and determine its geological structure with applications from geology to biology to mineral exploration. Could you provide more information on unmanned survey capacity? 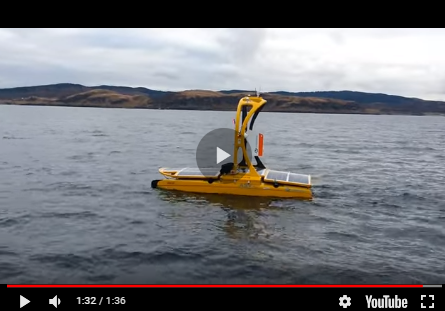 In recent years, autonomous underwater vehicles (AUVs) have become an important tool for marine scientists to learn more about our world's oceans and large water bodies. Today's AUVs are able to gather data in orders of magnitude greater than the traditional approach, operating at a low portion of the overall costs. The enhanced AUV architecture enables the deployment of a variety of new sensors, allows onboard data processing and decision making, and supports coordinated swarming behaviour through underwater and surface communication. Swarming patterns include search and tracking behaviours. A search behaviour involves AUVs that dive over a particular physical search area in a synchronised fashion. Communication is used to exchange and adjust AUV positions during the search. Tracking behaviours are useful to observe and follow dynamically developing oceanographic phenomena. In addition to single remotely-controlled and autonomous underwater vehicles, ongoing research deals with construction of coordinated missions to be performed by groups of such vehicles. Cooperation of multiple AUVs in a single mission can provide enormous advantages in terms of navigation and communication. What do you think of initiatives such as the Shell Xprize? Initiatives such as the Shell Xprize encourage scientists from all over the world to explore the oceans with new solutions. Such initiatives will accelerate innovation for the unmanned exploration of the unknown parts of the deep sea. Therefore, I consider such initiatives to be extremely important to improve our knowledge of marine autonomous technologies. You will be ERVO Group chairman for two years. What will be your biggest achievement once you handover to your successor? In cooperation with the European Marine Board (EMB), ERVO will publish a newly edited version of the catalogue European Ocean Research Fleets in the next two years. This catalogue will register all research vessels and large-scale facilities used in Europe. I hope that our contribution will make the ERVO group more visible in the European community. Dr. Klas Lackschewitz is a graduate geologist with a focus on marine geosciences and has carried out numerous cruises (>30) on national and international research vessels as part of his scientific work. Dr. Klas Lackschewitz has been a research vessel coordinator at the GEOMAR Helmholtz Institute for Ocean Research in Kiel since 2010 and a member of the ERVO Group, which he then took over in June 2017. He has lead the advisory group on the scientific and technical equipment of the new research vessel, which succeeds the German RVs Meteor and Poseidon since October 2016.